DeMar DeRozan of the Toronto Raptors was stunningly traded to the San Antonio Spurs on Wednesday for Kawhi Leonard in a decision that shocked the NBA world. It was a move that made a mockery of the suggestion that the day after the All-Star break is the slowest day in sports. DeRozan, Jakob Poeltl and protected 2019 first round pick headed south to San Antonio while Leonard, Danny Green and a reported $5 million made the trip across the border. It's a move that from a franchise and basketball sense works for the Raptors in either the short term or the long term, but was a head scratcher otherwise. 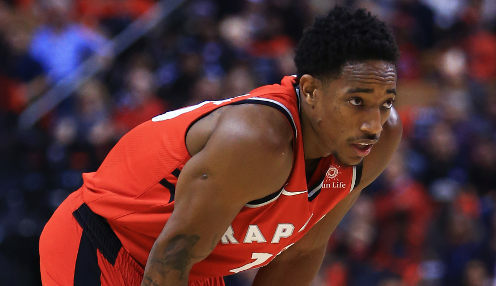 DeRozan was the face of the Raptors and was expected to see out his career in Toronto having not jumped at the chance to leave in free agency. Not surprisingly reports immediately came in that neither DeRozan, nor Leonard, who wants to play for the Los Angeles Lakers, were happy about the deal. The strange things is, with free agency a year away, suiting up for the Raptors for a single season might be a strong opportunity to make the NBA Finals this upcoming season. Certainly the Boston Celtics and Philadelphia 76ers will be more of a challenge this season, but Leonard is a superior perimeter defender who doesn't disappear in the postseason. DeRozan, for all his ability, is a liability on the defensive end at crunch time. For the Spurs they rid themselves of a headache, as somewhere along the line their relationship with their best player was irrevocably broken. The suspicion is that San Antonio should have taken an offer of young players and draft picks made by Boston at the trade deadline, but the club apparently does not want to go into a total rebuild. The Raptors are 9/1 to win the NBA Championship next season, with San Antonio 80/1. Golden State are 8/15 to retain their crown.